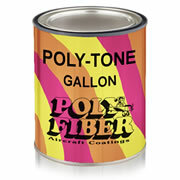 Poly-Tone Finish is a durable one-part, air-drying flexible coating available in 50 popular aircraft colors. Poly-Tone is manufactured from the same generic class of petrochemical feed stock as Poly-Tak, Poly-Brush, and Poly-Spray, and is considered to be our “standard” pigmented finish for the Poly-Fiber covering process. The thermo-expansion and elasticity are the same as all sub-coats, and there is no intercoat adhesion problem if the surface is clean. Poly-Tone is nonshrinking, non-bleeding, fire-retardant, chemical-resistant, and is used on both metal and fabric. It air dries to a satin gloss finish and can be polished to a high luster equal in appearance to any cellulose dope, lacquer, or synthetic enamel finish. PAINT PREPARATION: Pigments may hard settle after 3 months storage. We recommend inverting the can every 30 days to avoid pigment compaction. Pigments hard settled in extended storage should be dislodged from the bottom with a tool, then dispersed thoroughly by agitating with a double-action paint shaker for 5 minutes minimum. Filter thru 60x48 or finer mesh paint filter before using. SPRAYING EQUIPMENT: Poly-Tone may be sprayed with any equipment rated for lacquer and enamel. Clean the equipment with Poly-Fiber Reducer or Methyl Ethyl Ketone. COVERAGE: One gallon of Poly- Tone will cover approximately 200 sq ft with one coat. COLOR SEQUENCE: Apply light colors first, then overcoat with darker trim colors. All pigments are non- bleeding. DRYING TIME: Dust free in 20 minutes. Allow 12 hours drying before using masking tape. All drying times are given at 70°F and 50% relative humidity. Adding Blush Retarder will improve the gloss. THINNING: Poly-Tone is always thinned 4 to 1 with Poly-Fiber Reducer R 65-75 in normal 65°- 75° weather or RR 8500 Retarder Reducer in temperatures of 85° and up. Add Blush Retarder BR- 8600 as needed in hot humid weather. Using any other reducer or retarder may cause adverse characteristics. FINISHING NEW FABRIC SURFACES: After the Poly-Fiber covering process is completed thru Poly-Spray according to the Poly-Fiber Manual, and the last coat has dried approx. 1 hour, apply a minimum of 2 coats of Poly-Tone, allowing at least two hours drying time between coats. Wipe the surface lightly with a clean tack rag immediately before painting. Additional coats will depend on the Poly-Tone color, shade of the surface being painted, spray equipment, and the technique of the painter. An improperly adjusted gun or unskilled painter can waste half the paint in the air. Do not spray in direct sunlight or in wind. The fresh coat must remain wet for a few minutes to flow out and provide a satin gloss surface. Material thickened from evaporation in an open container may cobweb from the gun and cause orange peel finish. See thinning instructions. Poly-Tone may be lightly wet sanded with 400-grit or finer wetor- dry sandpaper between coats after drying 2 hours or longer. Coarse sandpaper will telegraph the roughness through the finish coat. FINISHING METAL SURFACES: We recommend stripping any old finish and repriming with EP-420 Epoxy Primer. Epoxy primer must be scuff sanded to provide tooth adhesion before re-coating with Poly-Tone, regardless of the cure time. SHELF LIFE: Guaranteed four years unopened in protected storage. Avoid long-range storage above 100°F. Not affected by freezing.